Model 1015 © 1946 Wurlitzer (The Rudolph Wurlitzer Co.). 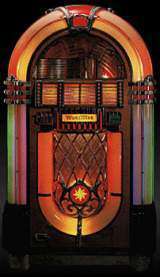 Considered by many to be the universal design for a jukebox. This is the model with the color-changing columns and bubble tubes and the arching top.